Washington • Just days ago, a panic-stricken Josh Holt took to social media to plead for his life, fearing riots in the Venezuelan prison he was held captive in for nearly two years would snuff out any hope he had left. On Saturday, the Utah native, wearing a borrowed suit and a smile, sat elbow-to-elbow with President Donald Trump in the Oval Office and thanked members of Congress, State Department officials and others for their collective efforts to free him. Holt then nodded to his wife, Thamara “Thamy” Caleno, whom he had just wed in 2016 when Venezuelan police arrested them. “But we’re still together,” he added, his left hand bearing his wedding band. Thamy, sitting on an adjacent couch holding hands with Holt’s mom, Laurie, sat silent, a White House aide translating what the president and others said into Spanish. Holt’s release, just days after Venezuelan President Nicolás Maduro won another term in what American officials and international watchdogs say was a sham election, came without conditions, U.S. officials said. Secretary of State Mike Pompeo tweeted Saturday night that U.S. policy toward Venezuela “remains unchanged,” and White House press secretary Sarah Huckabee Sanders thanked Venezuela for releasing Holt but said that the United States would continue sanctions against the country. Still, freeing Holt could be seen as a gesture by Venezuela, which faces shocking inflation and food shortages, in hopes of lessening economic sanctions by the United States and other countries. For nearly two years, Utah’s elected officials had pressed Trump and the State Department to get Venezuela to release Holt, a campaign that has grown over time. 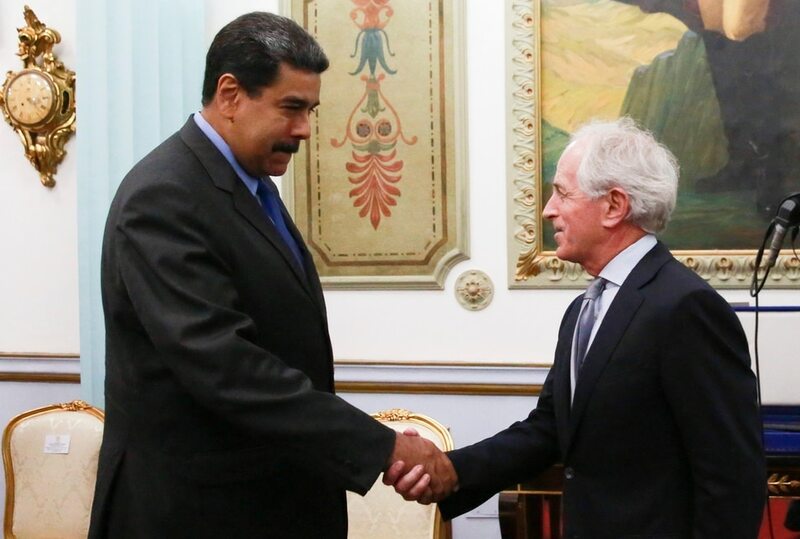 On Friday, Senate Foreign Relations Committee Chairman Bob Corker, R-Tenn., flew to the country to meet with Maduro and seek their release. Friday night, Sen. Orrin Hatch’s office got word that Holt and his wife would be let go, though the couple didn’t feel safe until they touched down at Dulles International Airport near Washington, D.C. Corker and the Holts flew on a Venezuelan-owned jet – with Holt’s jailer aboard – and at one moment they thought their freedom was gone. At Dulles, Holt was reunited with his parents. The long-awaited hugs lasted long; the tears flowed. Laurie Holt held her son’s head in her hands and kissed both cheeks. A medical team examined the Holts as they were driven in Hatch’s motorcade and after their appearance in the Oval Office they were whisked to a nearby hospital for care. Both suffered injuries while jailed. Trump, who said his administration had rescued 17 hostages held by foreign countries and was working to release more, praised Caleb McCarry, a GOP congressional staffer who has known Maduro for 15 years and had pressed Holt’s case personally to the Venezuelan president. The Oval Office crowd, which included White House Chief of Staff John Kelly and National Security Adviser John Bolton as well as State Department officials, erupted in applause. Rep. Mia Love, a Utah Republican who developed a friendship with Holt’s mom – Love says they talked almost daily sometimes, reassuring each other that Holt would return home – teared up as Trump asked her to speak. The president, who had phoned Love earlier in the day to tell her of the news, said Love brought up Holt’s case in every conversation they had so when he saw her, he would immediately say he was working on it. Love, in turn, said it was Josh’s mother who deserved credit for never giving up. In an interview after, Love said she and Laurie Holt planned to sip lemonade in one of their backyards soon to talk about the “distant past” that they have lived too long. Hatch, who called Maduro last week to personally plead for Holt’s release, took the lead in pushing the Utahn’s case. He held court with South American ambassadors and worked the State Department and White House to keep the issue forefront. At one point, a State Department official warned the senator it could hurt Hatch’s reputation if he kept pressing the issue and things went badly; Hatch said he wouldn’t give up. In the Oval Office on Saturday, Hatch sat close to Trump, aside Love, Corker and Sen. Mike Lee, R-Utah, and was effusive of Trump’s help. Then Hatch turned to Holt. Lee, who spoke Spanish to Thamy and her daughter, Marian, eliciting a “gracias” from both, welcomed Holt home and looked to Thamy. Holt, who had faced prison bars only hours before, donned a loose-fitting black suit loaned by Hatch’s deputy chief of staff and grinned even as he faced a barrage of cameras, reporters and American leaders. And then he looked at his wife. (Holt family photo via AP) In this image provided by the Holt family, Joshua Holt, his wife, Thamara, and her daughter, board a plane at the airport in Caracas, Venezuela, on Saturday, May 26, 2018. Jailed in Venezuela on weapons charges nearly two years ago, Holt was released Saturday after a U.S. senator pressed for his freedom in a surprise meeting with President Nicolas Maduro. 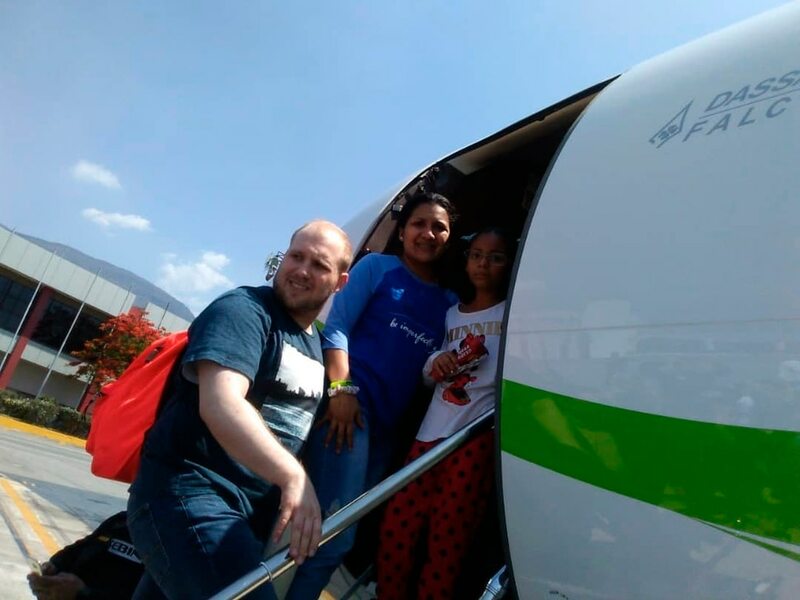 Holt and his wife, who also jailed, were reunited with her daughter from a previous relationship at Caracas’ airport where the three boarded a chartered flight to Washington. (Holt family photo via AP) In this image provided by the Holt family, Joshua Holt poses for a photo with his wife, Thamara, and her daughter, at the airport in Caracas, Venezuela, Saturday, May 26, 2018. Jailed in Venezuela on weapons charges nearly two years ago, Holt was released Saturday after a U.S. senator pressed for his freedom in a surprise meeting with President Nicolas Maduro. Holt and his wife, who also jailed, were reunited with her daughter from a previous relationship at Caracas’ airport where the three boarded a chartered flight to Washington. (Miraflores Presidential Press Office via AP) In this photo released by the Miraflores Presidential Press Office, Venezuela's President Nicolas Maduro, left, shakes hands with Republican Senator Bob Corker during a meeting at the Miraflores Presidential Palace in Caracas, Venezuela, Friday May 25, 2018. The Chairman of Senate Foreign Relations Committee met with Venezuelan President Nicolas Maduro two days after the embattled socialist leader kicked out the top U.S. diplomat in the country. There was no immediate comment from Republican Senator Bob Corker's office about the nature of the surprise visit. FILE - This July 13, 2016, file photo, Laurie Holt holds a photograph of her son Josh Holt at her home in Riverton, Utah. Venezuelan authorities on Wednesday, July 20, 2016, presented what they said are new details in the case against Josh Holt being held on weapons charges. Holt traveled to Venezuela last month on a tourist visa to marry a fellow Mormon he met on the internet. At the time of the arrest June 30, Holt's new wife, Thamara Caleno, was waiting for a U.S. visa so the pair could travel to his home in a suburb of Salt Lake City. (AP Photo/Rick Bowmer, File) Scott Sommerdorf | The Salt Lake Tribune Laurie Holt, Josh Holt's mother speaks at a rally on the east steps of the Utah State Capitol calling for the release of her 24-year-old son Josh Holt, who is currently jailed in Venezuela, Saturday, July 30, 2016. At left is her husband Jason Holt, with Josh's sisters Katie, and Jenna Holt, far right. Scott Sommerdorf | The Salt Lake Tribune Josh Holt's brother Derek Holt holds a photo of Josh with sister Jenna at left during a rally on the east steps of the Utah State Capitol for 24-year-old Josh Holt, who is currently jailed in Venezuela, Saturday, July 30, 2016. Leah Hogsten | The Salt Lake Tribune He's suffering right now and they won't treat him, said Laurie Holt about the condition of her son, Josh Holt, as a result of his July 3rd, 6 to 8-foot fall off his prison bunk bed. With her husband Jason Holt, U.S. Senator Orrin Hatch, and her attorney Carlos Trujillo at her side, Holt said Josh suffered a concussion and believe his back is fractured. Josh Holt has spent a year in a Venezuelan prison, where his family says he is being used as a political pawn. Holt, a former missionary with The Church of Jesus Christ of Latter-day Saints and a Riverton native, was arrested onÊJune 30, 2016. He had traveled to Venezuela to marry Thamara Caleno, a fellow Mormon he'd met online last January while looking for someone to practice Spanish with. Scott Sommerdorf | The Salt Lake Tribune Josh Holt's mother Laurie Holt hugs her uncle Leonard Bell after a rally on the east steps of the Utah State Capitol that called for the release of their 24-year-old son Josh Holt, who is currently jailed in Venezuela, Saturday, July 30, 2016. Scott Sommerdorf | The Salt Lake Tribune A rally underway on the east steps of the Utah State Capitol for 24-year-old Josh Holt, who is currently jailed in Venezuela, Saturday, July 30, 2016. Venezuelan authorities claim that Holt was a trained gunman, though his mother, Laurie Holt, who is organizing the rally, says he was there to marry a woman he met online. Leah Hogsten | The Salt Lake Tribune We do feel powerless, said Jason Holt about the condition of his son, Josh Holt, as a result of his July 3rd, 6 to 8-foot fall off his prison bunk bed and the family's efforts to bring him home. With U.S. Senator Orrin Hatch by their side, Laurie and Jason Holt said their son Josh suffered a concussion and believe his back is fractured. Josh Holt has spent a year in a Venezuelan prison, where his family says he is being used as a political pawn. Holt, a former missionary with The Church of Jesus Christ of Latter-day Saints and a Riverton native, was arrested onÊJune 30, 2016. He had traveled to Venezuela to marry Thamara Caleno, a fellow Mormon he'd met online last January while looking for someone to practice Spanish with. Leah Hogsten | The Salt Lake Tribune He's suffering right now and they won't treat him, said Laurie Holt about the condition of her son, Josh Holt, as a result of his July 3rd, 6 to 8-foot fall off his prison bunk bed. With U.S. Senator Orrin Hatch at her side, Holt said Josh suffered a concussion and believe his back is fractured. Josh Holt has spent a year in a Venezuelan prison, where his family says he is being used as a political pawn. Holt, a former missionary with The Church of Jesus Christ of Latter-day Saints and a Riverton native, was arrested onÊJune 30, 2016. He had traveled to Venezuela to marry Thamara Caleno, a fellow Mormon he'd met online last January while looking for someone to practice Spanish with. Leah Hogsten | The Salt Lake Tribune l-r Siblings Derek and Katie Holt fear for their brother, Josh Holt, who is suffering as a result of his July 3rd, 6 to 8-foot fall off his Venezuelan prison bunk bed. The family knows Josh suffered a concussion and believe his back is fractured. Josh Holt has spent a year in a Venezuelan prison, where his family says he is being used as a political pawn. Holt, a former missionary with The Church of Jesus Christ of Latter-day Saints and a Riverton native, was arrested onÊJune 30, 2016. He had traveled to Venezuela to marry Thamara Caleno, a fellow Mormon he'd met online last January while looking for someone to practice Spanish with. Leah Hogsten | The Salt Lake Tribune l-r Siblings Derek, Katie and Jenna Holt fear for their brother, Josh Holt, who is suffering as a result of his July 3rd, 6 to 8-foot fall off his Venezuelan prison bunk bed. The family knows Josh suffered a concussion and believe his back is fractured. Josh Holt has spent a year in a Venezuelan prison, where his family says he is being used as a political pawn. Holt, a former missionary with The Church of Jesus Christ of Latter-day Saints and a Riverton native, was arrested onÊJune 30, 2016. He had traveled to Venezuela to marry Thamara Caleno, a fellow Mormon he'd met online last January while looking for someone to practice Spanish with. Leah Hogsten | The Salt Lake Tribune l-r Jenna Holt fears for her brother, Josh Holt, who is suffering as a result of his July 3rd, 6 to 8-foot fall off his Venezuelan prison bunk bed. The family knows Josh suffered a concussion and believe his back is fractured. Josh Holt has spent a year in a Venezuelan prison, where his family says he is being used as a political pawn. Holt, a former missionary with The Church of Jesus Christ of Latter-day Saints and a Riverton native, was arrested onÊJune 30, 2016. He had traveled to Venezuela to marry Thamara Caleno, a fellow Mormon he'd met online last January while looking for someone to practice Spanish with. Scott Sommerdorf | The Salt Lake Tribune Thamara Caleo and Josh Holt, who are currently jailed in Venezuela, appear in a family photo displayed at a rally on the east steps of the Utah State Capitol, Saturday, July 30, 2016. Scott Sommerdorf | The Salt Lake Tribune Josh Holt, who is currently jailed in Venezuela, appears in a family photo displayed at a rally on the east steps of the Utah State Capitol, Saturday, July 30, 2016. Scott Sommerdorf | The Salt Lake Tribune A crowd of friends and family shout Bring Home Josh! at the end of a rally on the east steps of the Utah State Capitol for 24-year-old Josh Holt, who is currently jailed in Venezuela, Saturday, July 30, 2016. Leah Hogsten | The Salt Lake Tribune l-r Kelly Perry tries to comfort her sister-in-law, Laurie Holt, who fears for the life of her son Josh Holt, who has spent a year in a Venezuelan prison and is now severely injured after a fall. Holt, a former missionary with The Church of Jesus Christ of Latter-day Saints and a Riverton native, was arrested onÊJune 30, 2016. 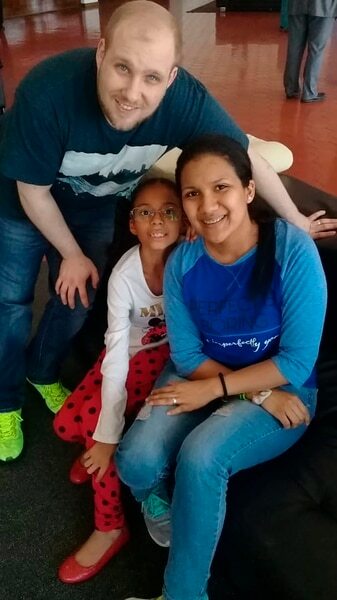 He had traveled to Venezuela to marry Thamara Caleno, a fellow Mormon he'd met online last January while looking for someone to practice Spanish with.